In June, Hadrosaur Productions published A KEPLER’S DOZEN: Thirteen Stories About Distant Worlds That Really Exist, a science fiction anthology co-edited by Steve B. Howell and David Lee Summers. In this first of two interviews, I talk to David Lee Summers about the anthology and a little bit about his other writing. David Lee Summers is the author of seven novels and over sixty published short stories. His writing spans a wide range of the imaginative from science fiction to fantasy to horror. Novels include a wild west steampunk adventure (OWLDANCE) and VAMPIRES OF THE SCARLET ORDER, in which vampire mercenaries fight evil. 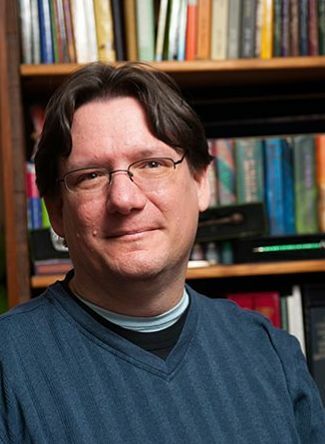 David edits the quarterly SF/F magazine TALES OF THE TALISMAN, and has also served as editors for the anthologies SPACE PIRATES and SPACE HORRORS. When not writing, David operates telescopes at Kitt Peak National Observatory. ANTHONY: Let’s talk about A KEPLER’S DOZEN first. What inspired the anthology? DAVID: Steve Howell and I have been friends since I returned to Kitt Peak National Observatory a little over five years ago. I was one of the Observing Assistants for the WIYN 3.5-meter telescope and he was the WIYN 3.5-meter telescope scientist. Over the years, Steve learned about my interest in writing, and even picked up one of the anthologies I was in. A couple of years ago, Steve left the National Optical Astronomy Observatory to work for NASA as the project scientist for the Kepler Space Mission. The Kepler space telescope has done a remarkable job finding planets around stars. Looking at the Kepler web site as I type this, I see over 3000 planet candidates and 136 confirmed planets. As someone who grew up and went through college and grad school only knowing about the planets in our own solar system, this is absolutely remarkable, but there’s a real danger of all these planets just becoming statistics. So, Steve’s idea was to assemble an anthology that showcased some of these planets and imagined what it would be like to see these worlds up close. It becomes a way to visualize the wide variety of planets the Kepler telescope has discovered. ANTHONY: Was there an open call for submissions or was it invite-only? Might we see “Another Kepler’s Dozen” in the future? DAVID: A Kepler’s Dozen was invite-only. We did that because we wanted each story to feature a unique planet and this allowed each author the opportunity to ask questions about the planet they chose. That said, one of the stories came in during the last reading period for Tales of the Talisman Magazine. I thought it was a great match for the anthology. Steve agreed and we invited the author to make a few minor revisions and we included it. Since we assigned the planets for A Kepler’s Dozen, more exoplanets have been found in the so-called habitable zones of their stars. This is the area where you might conceivably find life as we know it. So, yes, we’d like to do a follow-up anthology. I’d like to make this one at least semi-open. Perhaps there would be a way to sign up and select from a list of available planets (still over 120 to choose from!). ANTHONY: How did you split editorial duties with you co-editor, Steve B. Howell? DAVID: We both read for overall story. If there was something about the story we didn’t like, we discussed it and came up with a solution to propose to the author. From there, I read for the more in-depth grammar and spelling issues and he read to make sure the planets were portrayed as accurately as possible given what’s known. He allowed some leeway on that since, in fact, very little is known about all these worlds. ANTHONY: Steve is a project scientist for the Kepler mission, correct? What unique perspective did he bring to the project? DAVID: That’s right, Steve is Kepler’s project scientist. Of course he had a good handle on the most up-to-date information available from the Kepler telescope. Beyond that, he brought a real sense of fun to this project. It was clear he was delighted about people imagining what these planets might be like. One thing both science and science fiction share are people asking “what if” questions. What’s more, scientists thrive on challenges to conventional wisdom. So, he clearly liked it when authors challenged a picture he might have about the planets. In fact, in his own contribution to the anthology, Steve suggested that there could be a subtext hidden in the planet data that hasn’t been seen yet. ANTHONY: The Kepler mission hit a big snag last month with the failure of a second “reaction wheel” (out of four on the craft), affecting the telescope’s ability to remain focused on fixed points. What effect will project termination (if repairs aren’t possible) have on the search for habitable planets outside of our system? Is a second, improved Kepler mission a possibility? DAVID: In fact, there was another mission in the works before Kepler’s problems started. It’s called TESS (Transiting Exoplanet Survey Satellite) and it’s tentatively scheduled for launch in 2017. My understanding is that while Kepler focused on one region of the sky, picked because of a large number of sun-like stars, TESS will focus on nearby stars, so we’ll learn more about stars we might visit in the near future. Also, I gather there’s a good chance Kepler will continue to operate. The reaction wheel problem just means that it won’t be very likely to detect Earth-sized planets, but it will continue to collect data and monitor Jupiter-sized planets. What’s more, there are actually a lot of ground-based exoplanet surveys such as the HAT survey being conducted in Arizona and Hawaii by a group of Hungarian Astronomers. HAT stands for Hungarian-made Astronomical Telescopes. There are also ongoing searches at the 1.5-meter telescope at Arizona’s Whipple Observatory and at observatories in South America. So, despite Kepler’s problems, the hunt for exoplanets is far from over. ANTHONY: A neat feature of the book is that the introduction to each story includes data collected during the Kepler mission. How much guidance was given to the authors in terms of choosing the stars/planets to be used in their stories? DAVID: As a starting point, the authors were sent to the Kepler Mission website at http://kepler.nasa.gov and allowed to browse for a planet that captured their imagination. In some cases, the authors came back and had questions about details of the system for Steve. In other cases, authors asked about planets that would fit a certain set of criteria they had in mind for a story. Steve and I worked with them to find planets that would work in their stories. Sometimes a story idea had to be modified slightly, but with so many planets to choose from, modifications were actually pretty slight. Of course, Steve read the stories for accuracy and again made some suggestions, but those tended to be slight and only had minor impact on the stories being told. DAVID: “Hot Pursuit” tells the story of a band of space pirates who are hired to help transport stolen technology back to Earth. The technology’s creators kill the agent and want to do the same to the pirates who get away with the stolen goods. The pirates take refuge near a so-called hot Jupiter called Kepler-17b. This planet orbits its sun every one and a half days. Keep in mind that Mercury orbits our sun every 88 days. What’s more, the star Kepler-17 is an active star, meaning it has flares and starspots. This is good for the pirates because being near this star and planet makes them undetectable. The problem is, they can’t stay for long or else they will burn up. ANTHONY: How does this story tie in with your short stories in the SPACE PIRATES, SPACE HORRORS and SPACE BATTLES anthologies from Flying Pen Press? DAVID: “Hot Pursuit” features Captain Ellison Firebrandt and the crew of the Legacy, who are also featured in the Full-Throttle Space-Tales anthologies Space Pirates, Space Sirens, Space Tramps, and Space Battles. Chronologically, this story takes place immediately after the one in Space Sirens. My story in Space Horrors is, so far, the only one I’ve written for the Full-Throttle Space Tales series that does not feature the crew of the Legacy. That one is a vampire story set aboard a Bussard Ramjet, an idea that came to me while spending an evening in Robert Bussard’s Santa Fe home. ANTHONY: What projects are you working on currently? DAVID: Currently I’m wrapping up work on my second wild west steampunk adventure, Lightning Wolves. It’s a sequel to my novel Owl Dance. In the new story, Russians have invaded the Pacific Northwest in 1877 and are advancing into California. New weapons have proven ineffective or dangerously unstable and the one man who can help has disappeared into Apache Country, hunting ghosts. A healer and a former sheriff lead a band into the heart of the invasion to determine what makes the Russian forces so unstoppable while a young inventor thinks outside the box to create a new kind of weapon. DAVID: This is a tough question because there are so many books I love! So, let me narrow it down and pick my favorite anthology. It’s called A Very Large Array and it’s a collection of stories by New Mexico science fiction and fantasy authors. It was released in 1987, edited by Melinda M. Snodgrass and contains stories by Roger Zelazny, Jack Williamson, Stephen R. Donaldson and Fred Saberhagen. This is the anthology that introduced me to Suzy McKee Charnas and George R.R. Martin. If the names in this anthology haven’t convinced you to read it, then let me just say that what makes it wonderful is that it collects an amazing range of science fiction and fantasy writers from the early greats to contemporary masters. There’s hard sci fi, horror, and fantasy. It is one of the most compact windows into the universe of speculative fiction. You can follow David on Twitter @davidleesummers. His blog is located at davidleesummers.com. You can order print copies of A KEPLER’S DOZEN directly from Hadrosaur Productions, or find the ebooks on Smashwords. 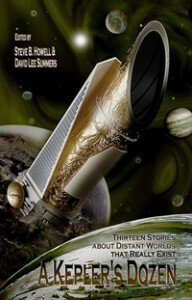 You can also find stories by both David Lee Summers and myself in FULL-THROTTLE SPACE TALES VOLUME 6: SPACE BATTLES.